A new open-world shooter from the creators of Sir, You Are Being Hunted, coming to PC in early 2017. A mysterious signal is coming from the planet Tölva, and your mission is to locate where it’s coming from and find out what it is. That, according to developer Big Robot, is the “heart of the game.” But you, whoever or whatever you are, don’t explore the surface yourself: you hijack a robot called a Surveyor and do it remotely. And if you die at the metal hands of an enemy faction also hunting for the signal, you can just hijack a new one. Similar to Sir, You Are Being Hunted, the studio’s previous game, it takes place in a large open-world and has a freeform structure. There are missions, but there’s no critical path, at least not in the traditional sense. But Tölva is not procedurally generated, and a lot of time has been spent carefully building the planet by hand. “This gives it quite a different feel, and a seamless map four times the size of an island in Sir.” says Big Robot. Even in the very early build I played, the planet is beautiful. There’s a lonely, haunting atmosphere to the place, with ancient starships half-buried in the dirt, crumbling ruins, and flocks of strange birds flying overhead. Artist Ian McQue has given the game a distinctive visual identity, and I love the muted colour palette and painterly textures. It’s incredibly stylish. 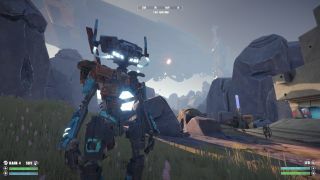 Big Robot describes the game’s world as a “canvas for exploration.” You’ll spend a lot of time exploring Tölva in your robot chassis, hunting for old technology to scavenge and bunkers to turn into bases where you can rearm and resupply. And the other robots, some of which will be friendly, will have their own objectives, giving you the sense that you’re not the most important person (well, robot) on the planet. Life goes on around you. “The game world is driven by AI activity that decides where they’ll go and what they’ll decide to do.” says Big Robot. You’ll see friendly robots leaving bunkers to survey wrecks and attack guard posts. I watched one clunk over to a ruined ship and run its scanner across it. And during a firefight I was delighted to see a few of them wade into the battle and help me out. You can use binoculars to scan distant robots and determine whether they’re friendly or not, and mark them Far Cry-style before engaging them in combat. My first brush with danger was when I spotted some kind of landing craft in the distance and peered at it through my binoculars. I tagged the robots guarding it and tried to make a stealthy approach, but failed almost immediately. Suddenly the night sky was filled with streaks of colourful laser fire and I ducked behind a rock, poking out to fire back with a long-range rail cannon. The shooting is satisfyingly weighty and intense, providing a stark counterpoint to the moments of quiet, thoughtful exploration. This ambient, hands-off approach to storytelling adds to the enigmatic nature of the planet and the signal emanating from it. I don’t know what it is, but I’m compelled to explore this strange, pretty place and find out. Sir was an interesting game that took strong cues from immersive sims, and I love that Big Robot is bringing their smart, open-ended design to a more hand-crafted setting. Especially one as evocative as this.